New data shows a growing number of migrants are finding jobs. A growing number of migrants are finding jobs in Germany, according to data released on Tuesday that will give heart to supporters of Chancellor Angela Merkel's decision to let in hundreds of thousands of war refugees since 2015. Figures last week also showed that German companies have managed to attract more apprentices to on-the-job training schemes due to a surge in applications from asylum seekers from Afghanistan and Syria. The figures will feed into a running debate in Germany on the impact of Merkel's decision in 2015 to open German borders to more than a million migrants, many of them refugees from war zones in Iraq, Syria and Afghanistan. Critics including the far-right Alternative for Germany (AfD) party have said the new arrivals will be a burden on Germany's welfare system and economy. 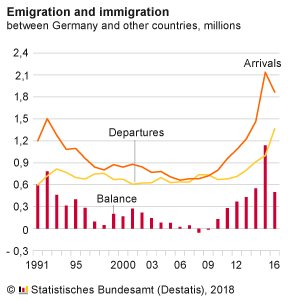 But the head of Germany's Labour Office, Detlef Scheele, told dpa news agency there was no reason to be overly pessimistic about the country's ability to cope with the record number of arrivals. "This is all going pretty well," he said, adding that the numbers were slightly better than expected. "These are good numbers, also taking into account that the people came here for humanitarian reasons and not for finding a job," Scheele added. The number of employed migrants from the eight countries with the biggest numbers of asylum seekers surged by more than 100,000 to 306,574 in May compared with the same month in the previous year, data from the Labour Office showed. Among those, roughly three out of four had a labour contract in which the company and the employee were paying full contributions to social insurance schemes, the data showed. There were roughly 500,000 people from the eight main asylum seeker countries who were registered as looking for work in July, the data showed. This includes people who are currently completing an integration and language course. Among those, nearly 197,000 people were registered as unemployed which is roughly in line with the level seen a year earlier, the data showed. Shortages of skilled labour and a lack of young people willing to commit to on-the-job training for up to 3-1/2 years have become big concerns for managers in Europe's largest economy. Vacancies for training positions have reached their highest level in more than 20 years with more than a third of companies unable to fill all of their training spots.